3. File on Time or Request an Extension. This year’s tax deadline is April 18. If the clock runs out, you can get an automatic six-month extension, bringing the filing date to October 16, 2017. You should keep in mind, however, that filing the extension itself does not give you more time to pay any taxes due. You will still owe interest on any amount not paid by the April deadline, plus a late-payment penalty if you have not paid at least 90 percent of your total tax by that date. 5. Don’t forget to check the box for healthcare coverage. Checking the box on line 61 of Form 1040 shows that you had healthcare for all 12 months during the tax year (2016). The IRS will still process your tax return if you forget to check the box but this applies ONLY to 2016 tax returns–and you’re not off the hook for any penalty you might owe. 6. Sign and Double Check Your Return. The IRS will not process tax returns that aren’t signed, so make sure that you sign and date your return. You should also double check your social security number, as well as any electronic payment or direct deposit numbers, and finally, make sure that your filing status is correct. If you maintain qualifying healthcare coverage for the entire year, you don’t need to do anything more than report that coverage on your federal income tax return by simply checking a box. Qualifying coverage includes most employer-sponsored coverage, coverage obtained through a Health Insurance Marketplace, coverage through most government-sponsored programs, as well as certain other specified health plans. The tax credit is worth up to 50 percent of your contribution toward employees’ premium costs (up to 35 percent for tax-exempt employers). The tax credit is highest for companies with fewer than 10 employees who are paid an average of $25,900 or less in 2016 ($26,200 in 2017). The smaller the business, the bigger the credit is. For example, if you have more than 10 FTEs or if the average wage is more than $25,900, the amount of the credit you receive will be less. For tax years 2010 through 2013, the maximum credit was 35 percent for small business employers and 25 percent for small tax-exempt employers such as charities. If you pay $50,000 a year toward workers’ health care premiums–and you qualify for a 15 percent credit–you’ll save $7,500. If you save $7,500 a year from tax year 2013 through 2016, that’s a total saving of $30,000. And, if in 2017 you qualify for a slightly larger credit, say 20 percent, your savings go from $7,500 a year to $12,000 a year. To be eligible for the credit, you must cover at least 50 percent of the cost of single (not family) health care coverage for each of your employees. You must also have fewer than 25 full-time equivalent employees (FTEs) and those employees must have average wages of less than $50,000 a year. This amount is adjusted for inflation annually and in 2016 was $52,000. Now let’s talk about average wages. Say you pay total wages of $200,000 and have 10 FTEs. To figure average wages you divide $200,000 by 10–the number of FTEs–and the result is your average wage. In this example, the average wage would be $20,000. Businesses that have already filed and later find that they qualified in 2014 or 2015 can still claim the credit by filing an amended return for one or both years. Don’t hesitate to call if you have any questions about the small business health care credit. And, if you need more time to determine eligibility this year we’ll help you file an automatic tax-filing extension. Estimated tax is the method used to pay tax on income that is not subject to withholding. This includes income from self-employment, interest, dividends, alimony, and rent, as well as gains from the sale of assets, prizes and awards. You also may have to pay estimated tax if the amount of income tax being withheld from your salary, pension, or other income is not enough. If you do not pay enough by the due date of each payment period you may be charged a penalty even if you are due a refund when you file your tax return. If you owed additional tax for the prior tax year, you may have to make estimated tax payments for the current tax year. The first estimated payment for 2017 is due April 18, 2017. For estimated tax purposes, the year is divided into four payment periods and each period has a specific payment due date. For the 2017 tax year, these dates are April 18, June 15, September 15, and January 16, 2018. You do not have to pay estimated taxes in January if you file your 2017 tax return by January 31, 2018, and pay the entire balance due with your return. Self-Employment Income. Self-employment can include income you received for part-time work. This is in addition to income from your regular job. Schedule C or C-EZ. You must file a Schedule C, Profit or Loss from Business, or Schedule C-EZ, Net Profit from Business, with your Form 1040. You may use Schedule C-EZ if you had expenses less than $5,000 and meet certain other conditions. Please call if you are not sure whether you can use this form. Self-Employment Tax. If you made a profit, you may have to pay self-employment tax as well as income tax. Self-employment tax includes Social Security and Medicare taxes. Use Schedule SE, Self-Employment Tax, to figure the tax. If you owe this tax, attach the schedule to your federal tax return. Estimated Tax. You may need to make estimated tax payments. These payments are typically made on income that is not subject to withholding. You usually pay estimated taxes in four annual installments. If you do not pay enough tax throughout the year, you may owe a penalty. See, Estimated Tax Payments – Q & A, above, for more information about estimated tax payments. Allowable Deductions. You can deduct expenses that you paid to run your business that are both ordinary and necessary. An ordinary expense is one that is common and accepted in your industry. A necessary expense is one that is helpful and proper for your trade or business. Questions about self-employment taxes? Help is just a phone call away. 1. Itemize. Taxpayers can only claim medical expenses that they paid for in 2016 if they itemize deductions on a federal tax return. Exceptions and special rules apply. Costs reimbursed by insurance or other sources normally do not qualify for a deduction. More examples of what costs taxpayers can and can’t deduct are in IRS Publication 502, Medical and Dental Expenses. 3. Travel Costs Count. It is possible to deduct travel costs paid for medical care. This includes costs such as public transportation, ambulance service, tolls and parking fees. For use of a car, deduct either the actual costs or the standard mileage rate for medical travel. The rate is 19 cents per mile for 2016. 4. No Double Benefit. Don’t claim a tax deduction for medical expenses paid with funds from your Health Savings Accounts (HSAs) or Flexible Spending Arrangements (FSAs). Amounts paid with funds from these plans are usually tax-free. If you’re wondering whether your medical and dental expenses are deductible on your tax return, don’t hesitate to contact the office. Be sure you have the written certification from the manufacturer that their product qualifies for this tax credit. It is usually posted on the manufacturer’s website or included with the product’s packaging. You can use this information to claim the credit, but do not attach it to your return. Keep it with your tax records. You may claim the credit on your 2016 tax return as long as you haven’t exceeded the lifetime limit in past years. Under current law, this credit is only available through December 31, 2016, for qualifying improvements to a taxpayer’s main U. S. home. The home must be in the U.S. It does not have to be your main home unless the alternative energy equipment is qualified fuel cell property. To claim these credits use Form 5695, Residential Energy Credits. If you would like more information on this topic, please call. 1. Dependent. Most of the time, taxpayers can claim their child as a dependent. Taxpayers can generally deduct $4,050 for each qualified dependent. If the taxpayer’s income is above a certain limit, this amount may be reduced. If you need help figuring out whether your child can be claimed as a dependent on your tax return, please call the office. 2. Child Tax Credit. Generally, taxpayers can claim the Child Tax Credit for each qualifying child under the age of 17. The maximum credit is $1,000 per child. Taxpayers who get less than the full amount of the credit may qualify for the Additional Child Tax Credit. Not sure if your child qualifies for the Child Tax Credit? Give the office a call. 3. Child and Dependent Care Credit. Taxpayers may be able to claim this credit if they paid for the care of one or more qualifying persons. Dependent children under age 13 are among those who qualify. Taxpayers must have paid for care so that they could work or look for work. Even if you don’t have dependent children, if you care for an elderly relative and can claim him or her as a dependent, you might be able to take the Child and Dependent Care Credit if you work or are looking for work. Please call for details. 4. Earned Income Tax Credit. Taxpayers who worked but earned less than $53,505 in 2016 should look into the EITC. They can get up to $6,269 in EITC. Taxpayers may qualify with or without children. 5. EITC and ACTC Refunds. Because of new tax-law change, the IRS is not able to issue refunds before February 15 for tax returns that claim the Earned Income Tax Credit (EITC) or the Additional Child Tax Credit (ACTC). This applies to the entire refund, even if a portion of the refund is not associated with these credits. 6. Adoption Credit. It is possible to claim a tax credit for certain costs paid to adopt a child. For details, see Form 8839, Qualified Adoption Expenses. 7. Education Tax Credits. An education credit can help with the cost of higher education. Two credits are available: the American Opportunity Tax Credit and the Lifetime Learning Credit. These credits may reduce the amount of tax owed. If the credit cuts a taxpayer’s tax to less than zero, it could mean a refund. Taxpayers may qualify even if they owe no tax. Complete Form 8863, Education Credits, and file a return to claim these credits. 8. Student Loan Interest. Taxpayers may be able to deduct interest paid on a qualified student loan. They can claim this benefit even if they do not itemize deductions. If you’re not sure if interest you paid on a student or educational loan is deductible, don’t hesitate to call. Questions about credits and deductions? Don’t hesitate to call the office today. That’s why QuickBooks has built-in tools to help you limit activity. Here’s how it works. To get started, open the Company menu and scroll down the list to highlight Set Up User Names and Password. On the slide-out menu, select Set Up Users. The User List window will open, and you should see your own entry as Admin. Click Add User. 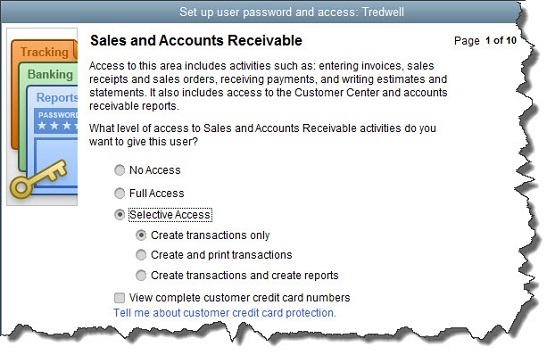 Figure 1: To give an employee access to QuickBooks, enter a User Name for him or her here, then a password. The Set up user password and access window will open. Fill in those fields and check the box in front of Add this user to my QuickBooks license. This will not be an option if you already have five users since that’s the maximum number allowed by QuickBooks Pro and Premier. To buy more, open the Help menu and select Manage My License, then Buy Additional User License. Tip: If you’re not sure how many user licenses you’ve purchased, hit your F2 key and look in the upper left corner. If you’ve maxed out and need more licenses, talk to us about upgrading to QuickBooks Enterprise Solutions. except for those that contain sensitive customer data, like credit card numbers). Click the button in front of the second option, then Next. Figure 2: You can specify the access rights for individual employees in numerous areas. The image above shows the first screen of 10 that display the levels of access available in many individual areas of QuickBooks. Be sure to read the whole page carefully before assigning rights. Here, for example, you’re not just allowing the employee to enter sales and A/R transactions. You’re also deciding whether to grant him or her permission to view the Customer Center and A/R reports. As you can see, your options are No Access, Full Access, and Selective Access (three levels there). Check the box below this list if you want the employee to be able to View complete customer credit card numbers. Sensitive Financial Reporting, which allows access to all QuickBooks reports. The option you choose here overrides all other reporting restrictions that you’ve specified for the employee. Finally, you’ll tell QuickBooks whether this person can change or delete transactions in designated areas and whether he or she can do so to transactions that were recorded before the closing date (if this applies). The last screen displays a summary of the access and activity rights you’ve given the employee. Check them carefully, and if they’re correct, click Finish. Figure 3: The User List window. QuickBooks then takes you back to the User List window, where you’ll see the employee’s name displayed. If you want to Add, Edit, Delete, or View a user, make sure the correct name is highlighted and click the button for the desired action. If you’re just now looking to add your first employee to QuickBooks or if you’re starting to outgrow the five-user limit, please call. There are more issues to consider when you take on multi-user access and a QuickBooks expert at the office would be more than happy to discuss them with you. Individuals – File an income tax return for 2016 (Form 1040, 1040A, or 1040EZ) and pay any tax due. If you want an automatic 6-month extension of time to file the return, file Form 4868, Application for Automatic Extension of Time To File U.S. Individual Income Tax Returnor you can get an extension by phone if you pay part or all of your estimate of income tax due with a credit card. Then file Form 1040, 1040A, or 1040EZ by October 16. Household Employers – If you paid cash wages of $2,000 or more in 2016 to a household employee, file Schedule H (Form 1040) with your income tax return and report any employment taxes. Report any federal unemployment (FUTA) tax on Schedule H if you paid total cash wages of $1,000 or more in any calendar quarter of 2015 or 2016 to household employees. Also, report any income tax you withheld for your household employees. Individuals – If you are not paying your 2017 income tax through withholding (or will not pay in enough tax during the year that way), pay the first installment of your 2017 estimated tax. Use Form 1040-ES. Corporations – File a 2016 calendar year income tax return (Form 1120) and pay any tax due. If you want an automatic 6-month extension of time to file the return, file Form 7004 and deposit what you estimate you owe in taxes. Corporations – Deposit the first installment of estimated income tax for 2017. A worksheet, Form 1120-W, is available to help you estimate your tax for the year. Caution: Taxpayers should be aware that an extension of time to file your return does notgrant you any extension of time to pay your taxes. In 2017, April 18 is the deadline for most to pay taxes owed and avoid penalty and interest charges. Individuals – File an income tax return for 2016 (Form 1040, 1040A, or 1040EZ) and pay any tax due. If you want an automatic 6-month extension of time to file the return, file Form 4868, Application for Automatic Extension of Time To File U.S. Individual Income Tax Return or you can get an extension by phone if you pay part or all of your estimate of income tax due with a credit card. Then file Form 1040, 1040A, or 1040EZ by October 16.